So far this series has a very Puella Magi Madoka Magica feel so if you're a fan, you might like this. For the most part I like the heroines, especially the main one Yuki who has a very strong will and didn't shy away like most magical girls (you never know how they'll react in this type of story). The background art is really really pretty in the battle scene so far and I have no complaints with the costume design and music. Overall, this is a series I"ll definitely keep my eye on this season. If you're into magical girls, then this is definitely a show worth paying attention to this Fall. The background for their confrontations with the evil that wants to destroy the world is solid, but you also get the feeling that there is more to the story than what they've been told. The characters have good (and funny) dialogue and are quite enjoyable. The transformations are exceptionally well done. The transformation animation is excellent and each transformation is tailored to fit the characters unique personality traits while also maintaining a central theme (flowers) that unifies them as a team. Plus the beautiful rainbow backgrounds are pleasing to look. Connections to Madoka Magika have already been made but I'm not sure this show is anywhere near dark enough to warrant the comparison. So far any time this show has started down a darker, more serious path...they just lighten the mood with a joke or gag. Honestly I hope this show can copy the success of a show like Madoka Magika without all the heart-breaking death and soul-shattering sadness. they really add nothing to the show and have no personality and are boring and unimaginative. A huge portion of the episode are long drawn out battles with silly dialog that becomes tedious. "Is the battle over yet?" frequently came to mind. So far, very little of the school life has been presented but it just does not seem all that interesting. Another terrible anime has reared its ugly head this season. It feels, strange and not in an interesting way.. Why set it in a school environment then make up a completely different reality to set the battles in? Well aside from that its very boring, i see no side characters to build up the story. So you are left with 4 girls who gain the power to protect the universe or something similar. It is boring and i couldn't enjoy the series past episode 2. Therefore i give this anime 3/10. 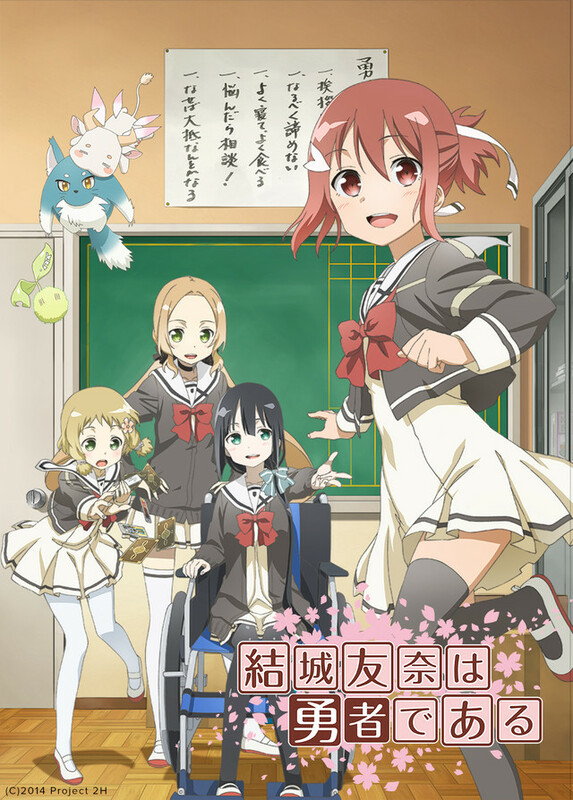 Don't watch this if you're expecting a decent magical girl story, like sailor moon and shugo chara. This Entire Show IS Heroic! By the way, I give this Anime a rating of 4.5...I wish You could actually give ½ Star ratings. First off, this is coming from Someone who has little experience with the entire "Magical Girl" type Show and Backgrounds. Take for example, I've never watched Madoka Magica; Really, the only that I can think of was this past Season's MAGICA WARS that was simulcast here on the 'Roll. Since then, I've watched through Cardcaptor Sakura, and gotten a better feel for the Genre. However, Yuki Yuna does not seem to fit within the matrix of "Magical Girl" type Anime to Me at all. Yes, there are transformations, and the Girls (temporarily) gain Super powers, but to Me, it has been done in a way that allows Yuna, and Her group of Friends, Karin, Tougou, Itsuki and their senpai Fu, to be cast in a bit of a different no doubt, but GOOD light! Each of the characters are quite personable, and I've found Myself having grown attached to them already. It's a very upbeat and cute Show, although still when the time for getting down and serious occurs, the Girls and the Sound and Animation stages of the Anime know exactly what to do. I like how it is able to take the aspects of certain 'dark' and/or 'sad' things that You'll see occurring to the characters and still...Especially when looking at Yuna, all She has is Her Friends. Already, each of the characters are experiencing a 'loss' in their Lives by the results of certain events happening. Yet, they keep that Smile on their faces and each Episode presents the Hero Club; A bunch of determined Ladies Out to do what they are led to do! They, as well as the Show itself are CHOCK full of "Girl Power" and the Show just makes a wonderful, wonderful find! I hope I've been of SOME help! It has been great so far, at least for me. In the latest episode as of my time of writing, I was taken aback and really admire the characters' drive in the face of all their woes and trepidation. All the characters of likable and, albeit slightly cliché, very well developed, and the premise of the plot and battles is consistent, deep, and relatively novel. The events, jokes and dialogue manage to not only hold my attention but to keep me looking forward to what happens next. I suppose it has some weak points, as well: I don't recommend this show to the impassive, haters of magic and moe, or those who don't like any of the 5 main characters in the show (because you won't see much of anyone else, apart from maybe one scene per episode), although it's hard to know in advance about the latter, isn't it? I also feel like the battles are lacking a major element at times and that the characters are paragons but archetypes, seldom straying from their usual patterns, but they far from manage to become flat. Overall, though, it's everything I expect from its genre of anime and sometimes more. It's not sufficiently magnificent as to earn 5 stars, but it is still one of the better series I've watched this season. Characters: 4 Battles: 3 Production value: 4.5 Plot: 3.5 Humour: 4 Overall: 4/5. Cheers! This show requires patience, don't quit. The title sounds more negative than it is. Read on. This review will sound more negative than it is. Read further. This review may not help many of you at all. Please continue to read. Is Fu's voice actor cannot cry believably. I wanted to turn the show off when she started her screaming/sobbing in episode 9. Seriously, if I wanted to hear that kind of horrible acting... I would watch Twilight New Moon and listen to Kristen Stewarts howling. I am being unnecessarily mean here, but it hurt my ears and annoyed me to no end. It ruined that episode for me. But seriously, watch this show past the first couple of episodes and I think you will want to continue. Truly. Until you have reached the end-of-episode screen on episode 12, you have not experienced YuYuYu to its maximum potential. This show came roaring out of left field and is hands down, without a doubt, one of the best shows of not only fall, but of the entire year. This show started off as having potential, but only that; and then episode 9 happened. It started breaking open the flood gates at this point, cashing in all the built-up plot and angst in the best way possible over the last few episodes, up until the very final moment. Each time you think you were home free and you knew what sort of plot twist was to come, a new one came in and twisted the knife even further. Even episode 12 was not the same in this regard throughout. One thing I will address now: stop comparing it to Madoka. Madoka was an absolutely fantastic anime that took "magical girl" and flung it right upside down. So does this one...but that's where the similarities stop. They both turn dark and serious but in completely tangential ways, if even that. And to further that request, if you find anything half-hearted or "not dark enough", then you were watching something, but certainly not Yuki Yuna. If you ask me, this went beyond any expectations you should have for dark. These girls, and us as the audience, experience pain and darkness that we have not seen before. Each time you think you have the darkness down, a new aspect injures you, especially in episode 12. You have to think about what you're seeing. There are so many symbols and huge plot points that you will miss if you tunnel vision while watching. If you watch this show thinking it's Madoka, you will miss some key details. Quite frankly if you watch this show thinking it isn't one of the better shows this season, you will miss the key details that make it such. This show will gut you to tears. And if you didn't, you have failed as a watcher. EDIT: for those curious, a second season is all but confirmed right now. Don't be turned off by the first few episodes of Yuki Yuna is a Hero. This is not a typical slice of life or magical girl show. It's more like Angel Beats or Selector Wixoss than Card Captor Sakura or Sailor Moon. Like Steins;Gate, the first half is needed to build characters with sufficient depth to make the later episodes work. When I first saw Steins;Gate, I only made it about 2 episodes before giving up. I didn't like the main character and it seemed overly silly. Only after reading later reviews did I try again and it is now one of my all time favorite shows. While Yuki Yuna isn't quite that good, it is easily one of the best of this season. Don't make the mistake of thinking that it's shallow fluff based on the beginning. Well animated and colorful Magical-Girl anime that is surprisingly more polished than most of the other shows this season. Cute to the Nth degree, Yuna and her club mates learn that their after-school volunteer activities include saving the world in addition to their already busy schedule of trying to help others in all aspects of their community; coupled with a well rounded cast of characters that'll make mostly anybody melt from all the adorableness. It is genuinely difficult NOT to smile at this anime. Despite all this, the show takes an unusually dark twist halfway through, making it suddenly a much more mature show than you'd expect, given the previous episodes. I'm not particularly in to the whole Magical transforming middle schooler genre by any means, but the amount of detail in the animation and the artistic design for the outfits, the monsters and fairies make this show a creative pleasure to watch.